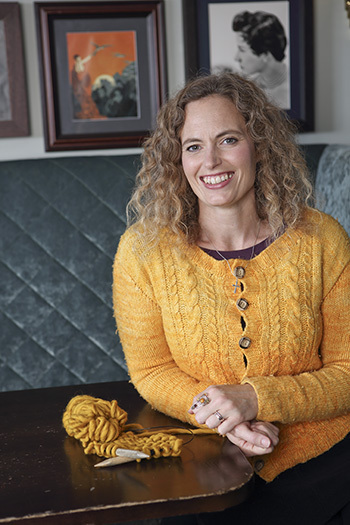 Exeter alumna Christine Boggis (1995, English) reflects on the life-changing joy of knitting, unveils her new book, JOMO Knits, and shares a knitting pattern for a stunning Exeter College scarf. There’s nothing new about the fear of missing out – it’s something most if not all people will experience at times in their lives. But it’s only in recent years that it’s been pounced on by marketers, who coined the acronym FOMO to try and pressure us into buying anything from luxury holidays and concert tickets to smoothies and vegan burgers. Fightback came from an unexpected place: the craft sector. Crafters of all kinds stood up against the marketing and media hype and announced that far from being afraid of missing out, they were delighted to. They were going to stay at home and knit, crochet and papercraft, thank you very much, and they called this JOMO – the joy of missing out. I’ve been a slave to FOMO for much of my life – during my time at Exeter you would have found me at anything from balls and dinners to DTMs and the late-night kebab van, and from the women’s football, netball and darts teams to watching friends’ music concerts, plays and University Challenge appearances. It’s only been in the past few years that I’ve realised that staying home with my wool isn’t missing out – it’s what makes me happy. It may just be that I’m older now, or that my top favourite people in the world (my husband, Glen, children Stanley aged nine and Daisy aged six, and two gerbils) now live in my house, or that knitting, which used to be a part-time hobby, has now become a full-time obsession – but for whatever reason, these days I’m fully embracing the joy of missing out. 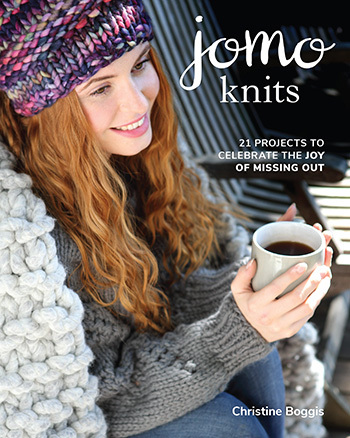 So when I decided to write my first collection of knitwear designs, which was released in April 2019 in the UK and goes on sale in early summer in the US, JOMO Knits was the obvious title. As well as featuring 21 knitwear designs, including some that are perfect for absolute beginners, the book includes notes on great knitting reads, inspiring knitters and how to use knitting as part of your mindfulness practice. After I left Exeter College in 1998 I first went travelling for a year in South East Asia and Australia, then trained as a journalist. Starting out as a cub reporter on local paper the Eastbourne Herald, I went on to work for an international newswire in Vienna, a legal and lifestyle magazine in the City and a drinks trade magazine, which left me very well educated in all kinds of alcohol. Since 2015 I have been editor of Knitting magazine, a monthly fashion-led hand-knitting magazine which sells in the UK and around the world. I also write regularly for its sister publication, Breathe, a mindfulness and wellbeing magazine that is also published worldwide. Being immersed in the world of knitting, I hear so many stories about people who have suffered from all kinds of problems – from seriously debilitating physical conditions like strokes to the kind of severe anxiety and depression that leaves you unable to leave your home. All of these people have been helped – some would say saved – by knitting. There are all kinds of benefits to knitting. Studies have found that the rhythmic activity, the feeling of soft wool in your hands and the way the needles cross your body as you craft all have soothing effects. For some knitters, knowing that if they go into a room with strangers they can pick up their knitting and not have to worry about social interaction is enough to help them get over crippling shyness. In my case, I often find it hard to relax after a stressful day in a busy workplace. Knitting helps me let out that nervous tension and gives me something to do with my hands if I can’t sit still. As someone who has struggled with anxiety and depression all my adult life – and it probably began during my time at Exeter, although I wasn’t to recognise it until later on – I am really keen to spread the word about the calming and relaxing effects of knitting to as many people as possible. That’s why I’ve designed this Exeter College scarf, which I hope students at the College will love to knit. It’s a really quick and easy knit, perfect for absolute beginners, and thanks to YouTube you’ll never find yourself short of knitting tutorials or help. I’ve suggested some videos to help you with the skills involved, but there are plenty of others out there as well. 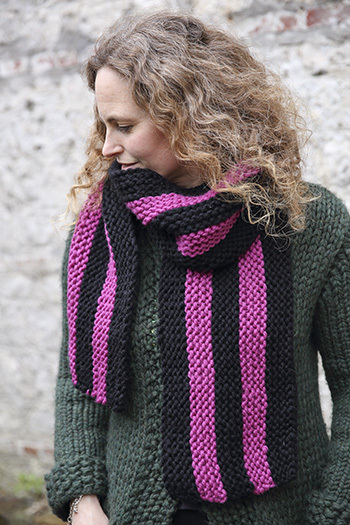 If you’ve got friends in other colleges who would like to learn to knit, it’s easy to adapt this pattern to any vertical-striped scarf by simply changing the colours you use. I chose Rowan’s Big Wool, partly because it’s super soft and feels lovely to knit with, and partly because you can buy it from your local yarn store, the Oxford Yarn Store www.oxfordyarnstore.co.uk. The shop runs plenty of knitting classes and groups, so you can get help with any difficulties and even meet new friends. JOMO Knits by Christine Boggis is published by GMC and is available from thegmcgroup.com and many good bookshops. To view Christine’s pattern for the Exeter College scarf click here.